Most of young African American men grow up wanting to be like the latest NBA star of their time. I started playing basketball in 3rd grade; my best friend at the time introduced me to the game. My life has not been the same since; it is like a drug. I get hoop fever if I don’t touch a ball. My parents had me in every sport though. I didn’t “specialize” in anything until high school realistically. I was on a little league baseball team Monday through Friday, bowling league every Saturday morning, tennis 5th-6th grade, and basketball in the alley in between those times. For the most part, growing up in a huge city like Chicago, kids played whatever sport was easily accessible with the given resources in the area. I am sure that if hockey field houses, skate parks, and more indoor swimming facilities were around the south side – we would take on those sports too. Lacrosse is growing at an alarming rate in this country, how did lacrosse find you Brock? What is your story about that experience? Brock Response – I was introduced to the sport of lacrosse by my stepfather, who played at Penn State University. While in elementary school he purchased me my first lacrosse stick that he had to cut shorter to adjust to my height. 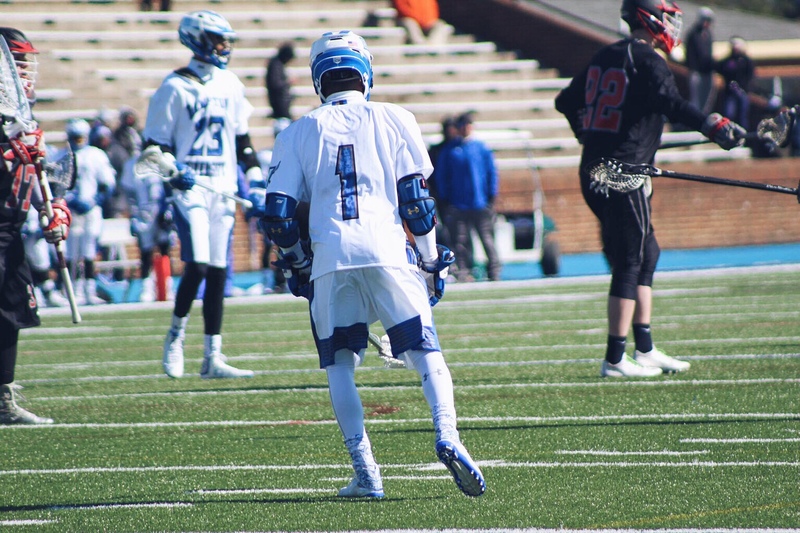 Once I reached fourth grade I began playing for Geronimo Lacrosse, a club league right outside of Richmond, Va. From the moment I got my first stick I couldn’t put it down. As I grew up and watched those like Kyle Harrison at Johns Hopkins, and the Bratton twins at University of Virginia I knew I wanted to be just like them. Lacrosse has seemingly developed an association with affluence in the United States; to me it looks like something played on the front lawn at Hogwarts in Harry Potter. The sport is incredibly complex and requires true skill. I think if the sport had a larger player pool, it would evolve even more. What initiatives can take place to continue diversifying lacrosse? Brock Response – Getting sticks to underprivileged communities would really help diversify the sport. One big problem with lacrosse is that the equipment is so expensive. You can easily go to a sporting goods store and leave with a $150 stick. You haven’t even began to look for a helmet, shoulder pads, elbow pads, gloves or cleats. Many people just cannot afford to buy their ten-year-old son $500 worth of equipment for him to turn around and not want to play the next season. 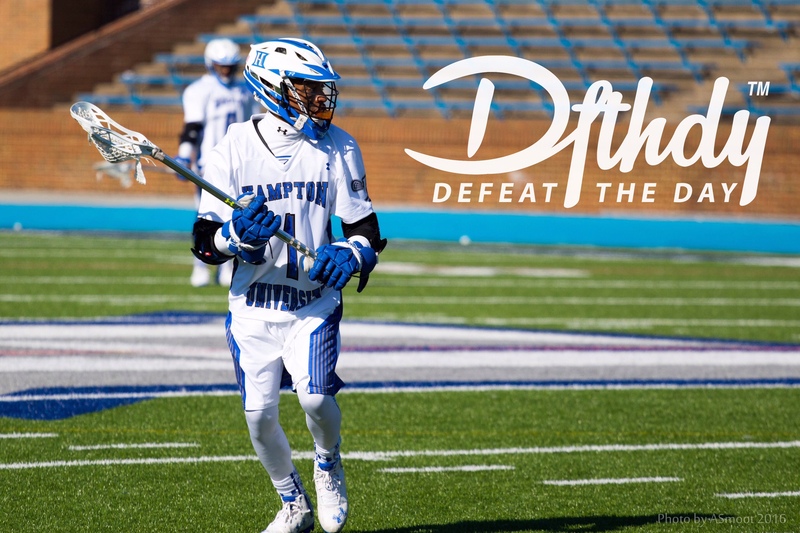 What was the process like to get a lacrosse team at Hampton University? Brock Response – It began five years ago when Michael Crawford wrote a letter proposing the start of a club lacrosse team. When he passed away his mother would not let his dream die and ended up finding her way in contact with Lloyd Carter, a former lacrosse player at Morgan Sate University. This lead to Coach Carter making the trip from Baltimore, MD every other weekend to practice and teach the sport to those few students who came out to try lacrosse. Five years later, after many rough seasons of hard work and dedication, President Dr. William R. Harvey sends out an email informing the student body that we would be fielding a Division I women’s soccer and men’s lacrosse team. Many people do not know that athletic programs at Historically Black Colleges and Universities (HBCU’s) dominated before blacks were allowed to attend predominantly white institutions (PWI). Do you think that HBCU’s can make a return to those days? Brock Response- I really think they can. As the funding for HBCU athletics grows, so will the programs. One thing that separates HBCU programs from PWI is the facilities and the amount of money put into the program. When recruits are visiting and looking at schools to attend, things like gear and facilities play a large part. It is much easier to convince a high school student to attend your university when you can promise him or her that they will be playing multiple games on television, receive endless gear, and be able to train in the most up to date facilities. Once the exposure and funding becomes similar, HBCU will take over athletics. When I was at Howard University, “the REAL HU” hahaha, I was a practice player/walk-on for the men’s basketball team. At the time I wanted to transfer to a small PWI that was willing to give me a scholarship, but I had to make a choice. Stay at Howard University, be an unrecognized player and earn a prestigious degree or go to a PWI just to be another basketball player. It was probably the biggest sacrifice I had to make. In hindsight, the network I have now and the experience I had at Howard far outweighs a PWI with brand new training facilities, polished resources, etc. Sometimes I wonder what impact HBCU’s can make within athletics if they kept the tradition, networks, supportive atmosphere, but added brand new sports facilities. Just think about that Brock, our institutions would attract the top 100 high school athletes in every sport. HBCU’s would be on top again! Brock Response- I think you are exactly right. When I was looking at schools to attend I had the option to attend smaller PWI’s to play lacrosse or go to Hampton University, my dream school, and focus solely on my degree. It was a tough decision for me because I loved the game of lacrosse so much. However, I knew that a school like Hampton was where I needed to be. HBCU’s would definitely attract many of the top recruits with just a few changes. How did it feel to score Hamptons FIRST ever lacrosse goal? What ran through your head after that? Brock Response – It was like nothing I’d ever felt before! I just remember releasing the ball and seeing the net move. Hearing the crowd screaming just topped off the moment. It made the game feel real again after being so distracted by the hype of all of the media and cameras all week. It really didn’t hit me that it was the first goal in history until I went to the sideline and got the ball from coach after the game. Last question bro, How do you continue to defeat your day? What is your training routine like? Brock response- I start and end every day with lacrosse. Get up early to go workout and end the night by watching old lacrosse games. Monday, Wednesday, and Friday evenings consist of team practice. Tuesday and Thursdays are dedicated to wall ball, shooting, and watching film with the team. On the weekends I try to get to the field with a few of my teammates to toss around and get my body some rest. Thanks for sharing this exclusive insight with us Brock. 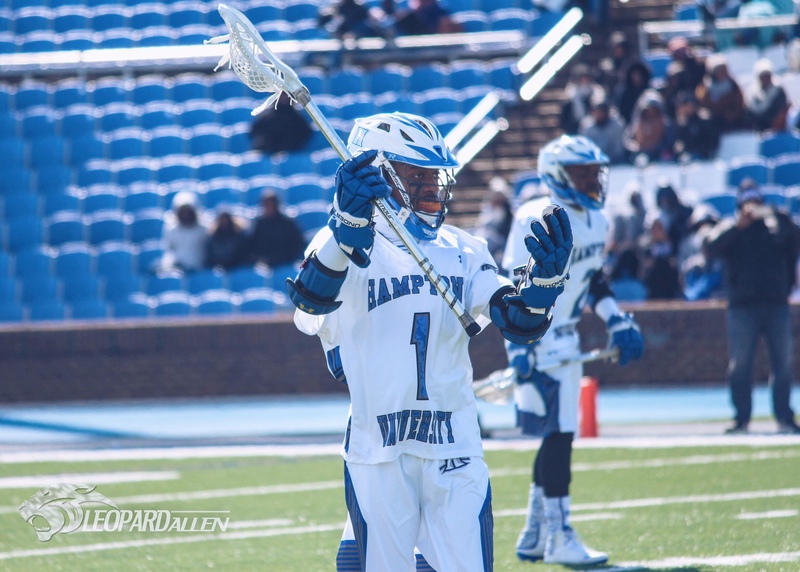 To our readers looking to follow Hampton University athletics, visit Hampton Lacrosse. 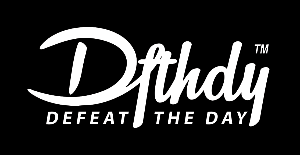 Special thanks to Brian @briankeithii for making this happen !